Racheal and I decided on the same pattern that Anna used for Miriam's bridesmaids, McCall's 3954. While we were waiting for the fabric to come in, it hit me what I had just agreed to. I had less than three months to make 5 dresses! Well, it was an easy pattern and I knew I could do it. I will post more pictures once all the dresses are done. I decided to take a break to let everyone know what I'm doing right now. A popular bridesmaid pattern, apparently :-). 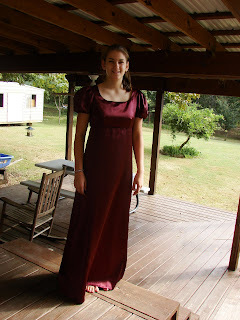 I made the same pattern for a maid-of-honor dress I wore a few years ago. I love the pattern, and it turned out nicely in the picture you have! I ended up having to size down the pattern 2 sizes and alter the darts a tad, but it was a perfect fit after that :-). It looks beautiful, Miriam! Great job! The other 3 will come together in no time. I really like the color too - quite lovely! Great job! Thanks for the update. You are doing a fine job!! Keep it up! Your doing a good job! I like that pattern. Thats a really pretty color for a wedding. Wish I would have thought of that. It looks beautiful. Don't take your God-given gift for granted. It looks great! They are going to be fabulous! That dress looks beautiful!!!!! Great job!! !